Plant breeder Stephen Baenziger points to the male part of a wheat floret. 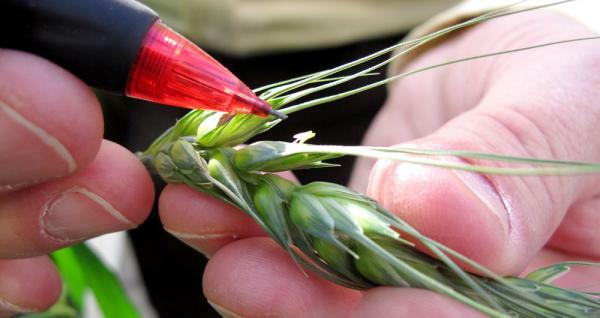 Removing this section by hand is one researchers create hybrid forms of wheat. Nebraska wheat breeder Stephen Baezinger says corn breeders began experimenting with hybrid varieties in the early 20th century. Scientist Amanda Easterly says while wheat research got a later start than corn, researchers can leverage modern technology. Wheat is one of the world’s staple foods and a big crop on the Great Plains, but it has been left in the dust. A corn farmer can grow 44 percent more bushels per acre than 30 years ago, but only 16 percent more wheat. That’s led many farmers to make a switch. The U.S. used to be one of the top wheat producers in the world, but Joehl says that has been slipping. 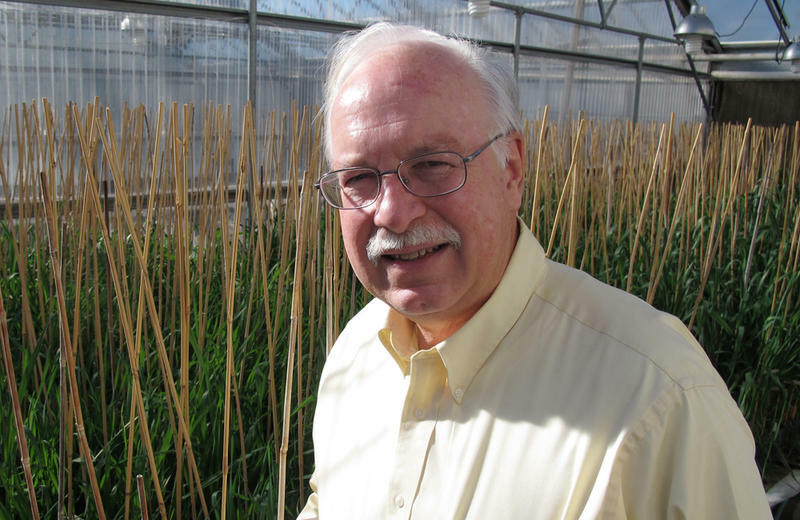 Joehl says the way to turn that around is by revitalizing wheat research. NAWG is developing what is being called the National Wheat Action Plan. One way the industry could catch up is with wheat hybrids. Hybrid crops are made by crossing two parent plants instead of allowing them to self-pollinate. If they’re compatible, you can see a jump in yield over conventional breeding. Hybrid corn has been around for about a century. It’s one of the reasons for the big gains in corn yield. Researchers have developed hybrid sorghum, rice and canola, but there is currently no hybrid wheat on the market. Seed companies have tried to create hybrid wheat before, in the 1970s and 1980s, but University of Nebraska Lincoln plant breeder Stephen Baenziger says the project became too expensive. “They spent 15-20 years developing hybrid wheats and by the end of it didn’t see enough progress,” Baenziger said. Now, a handful of university wheat breeding programs including UNL and Texas A&M are putting part of their seed science efforts toward hybrids. Public breeding programs are a big part of the wheat seed industry. Baenziger estimates 60-70 percent of wheat varieties planted in states like Colorado, Kansas and Nebraska come from university research. Inside Baenziger’s greenhouse in Lincoln, Neb., tables are topped with rows of potted wheat plants. “We’re transferring the hybrid system in spring wheats in Australia to hard red and hard white winter wheats that will be grown in Nebraska,” Baenziger said, grabbing a stem and bending down to take a closer look. After cross-pollinating the plants researchers can start testing hundreds of combinations of wheat varieties to see which ones create a hybrid bump in yield. Corn is easy to hybridize because the male and female parts of the plant – the tassel and the ear – are separate. In wheat they’re packed inside a tiny floret. Hybrid research takes a lot of trial and error, and Stephen Baenziger says wheat is at a huge disadvantage in research manpower. It could be another 5-10 years before there is a breakthrough with hybrid wheat. But if it works, hybrids could be a boost both for farmers and for seed companies. 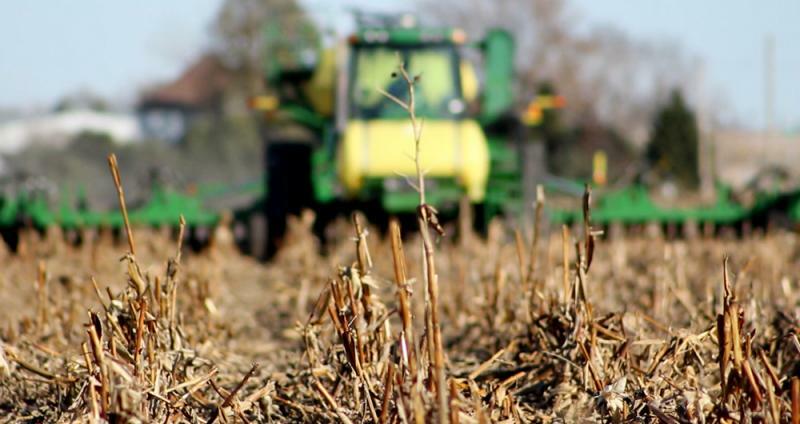 Farmers have to buy new hybrid seed each year, which would be a change for an industry in which many producers save part of the crop to replant. Syngenta, Bayer, and DuPont have each said they have hybrid wheat in the works. If they are the first to develop a high-yielding hybrid, it could help them corner the market for wheat seed. Unlike corn and soybeans, which are dominated by just a few companies, wheat seed sales are divided among a broader mix of commercial companies and even universities marketing their own varieties. 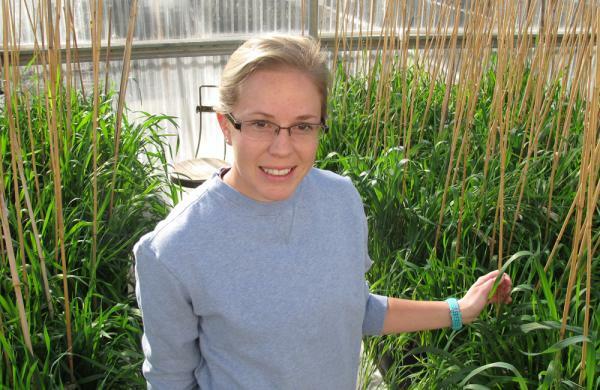 Hybrid wheat could also be a first step toward genetically modified wheat. There is no genetically modified wheat on the market. The National Association of Wheat Growers’ Steve Joehl says part of the reason is conventional breeding is cheaper and biotech traits come with regulatory hurdles. But there are some problems breeding can’t seem to solve, such as a fungus called wheat scab. Are wheat farmers looking for hybrids and GMOs? Michael Thomas farms wheat, soybeans and corn near Ogallala, Neb. He’s seen how research can pay off. “These corn varieties have certainly made them yield more and get by with less water and it’s fairly miraculous really,” Thomas said. But Thomas is cautious about going the biotech route with wheat. Given the resistance many people have toward GMOs, even though scientists say they’re safe, Thomas isn’t sure they’re worth the risk. The main issue Thomas is concerned about is demand. The gluten-free craze has people eating less bread. That’s hurt wheat prices. Couple that with a research gap and farmers are switching to corn. How to raise more wheat, and make more money for farmers, is what researchers have to figure out if the industry wants to keep from losing more ground. High on the Nebraska plains, there’s a citrus grove with trees holding up a canopy of lemons, grapefruit-sized oranges, green figs, and bunches of grapes. Yes, it’s indoors. And it’s only possible because it taps in to the core of the earth’s own energy, geothermal heating in the winter and cooling in the summer. Russ Finch, a former mail carrier and farmer, designed the greenhouse, which he calls the Greenhouse in the Snow. The original, which he built more than 20 years ago, is connected to his home. By some estimates, producing our food consumes about a fifth of the nation’s energy supply. It takes a lot of diesel to move tractors and semis around the farm, and electricity to pump water and dry grain. But some farmers are trying to cut back on the coal and gas they use and make our food system more energy efficient. When winter comes to Greg Brummond’s farm in northeast Nebraska, he spends his days in the machine shed fixing all the things that broke through the year. 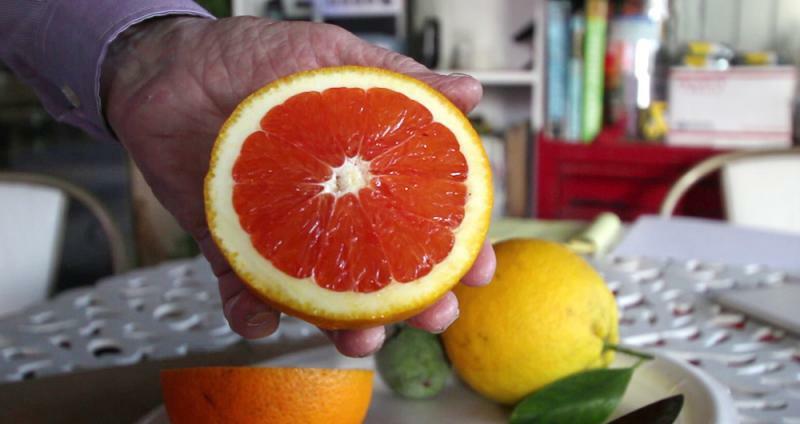 The U.S. Senate rejected a bill Wednesday that would have outlawed states from mandating labels on foods with genetically-modified ingredients, leaving the issue in limbo as a state labeling law looms. The measure by Sen. Pat Roberts, a Kansas Republican, failed to get the 60 votes needed to move ahead, leaving the path open for Vermont’s mandatory labeling law to go into effect July 1. That was quickly applauded by Democratic presidential candidate Bernie Sanders of Vermont.